Are you looking for goalkeeper coaching jobs in swansea? If yes, please visit www.goalkeeper-jobs.com. Just4keepers International Goalkeeping Academy have an opening for a goalkeeper coach in swansea. This is a wonderful opportunity to work with the leading goalkeeper coaching schools worldwide that now operates in 14 countries and 4 continents. Cannot believe it guys, I am 40 and still playing. So if anybody is in the Liverpool area this afternoon and wants to see a display of pure goalkeeping excellence come to Childwall SportsCollege and see me in action!! Moral of my story: As long as you enjoy your goalkeeping keep playing! 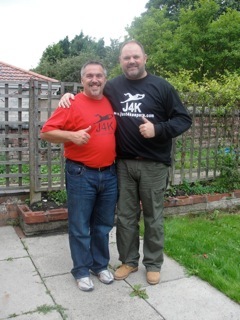 Come and become the next Just4keepers success story! Are you looking for goalkeeper coaching jobs in Newcastle? If yes, please visit www.goalkeeper-jobs.com. Just4keepers International Goalkeeping Academy have an opening for a goalkeeper coach in Newcastle. This is a wonderful opportunity to work with the leading goalkeeper coaching schools worldwide. Its been a busy few months for J4k with Just4keepers hosting goalkeeper schools and goalkeeper training camps all over the world. below is a picture of the J4K students enjoying their time at the Toronto Goalkeeper camps ran by Ricardo Grecco. 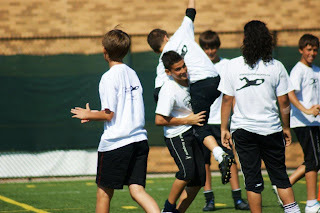 Even though J4K is the leading and largest goalkeeper coaching academy worldwide, it is a family run goalkeeper organization. 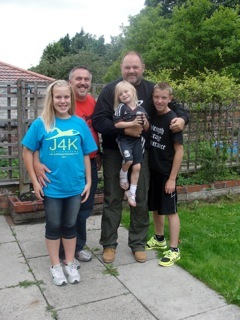 Below you will see J4K Founder Ray Newland and his daughter meeting up with Joe Weirs (J4K Pennsylvania) and his children meeting up for a BBQ at Rays home, Liverpool UK. Ray, Joe and their children. And the BBQ as not even started yet! Here is the team picture of the coaches and students of the 2011 Just4keepers Goalkeeper Residential held in Oundle UK.